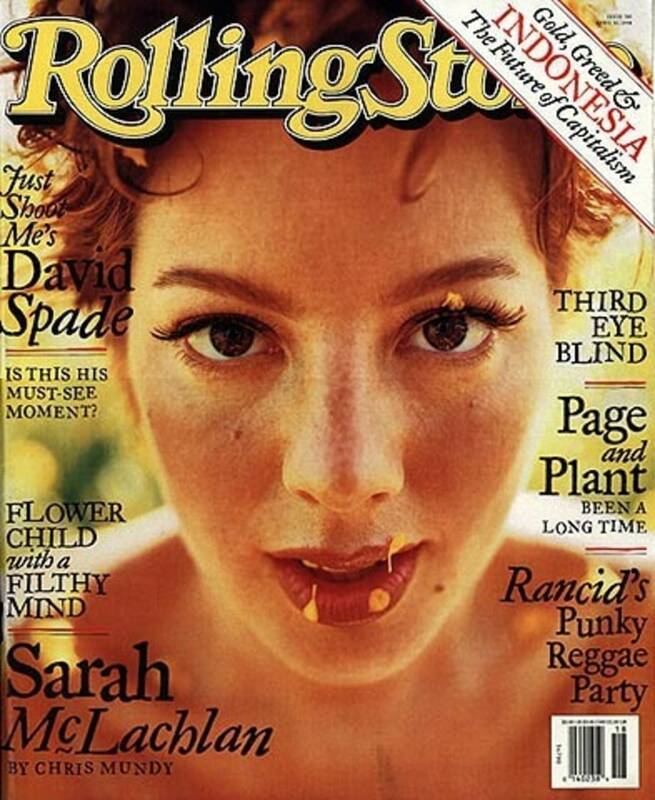 Growing up, most girls my age were not listening to Sarah McLachlan’s music on the radio. In 1997, at the height of her fame, our palates were still too unrefined to digest the weight of a song like “Adia,” and we hadn’t yet gone up against the sort of hardships that women in the entertainment industry face daily—something McLachlan was already fighting for. We were far more interested in the Spice Girls, and busied ourselves by riding our bikes to the corner store to buy foil-wrapped packs of Backstreet Boys stickers or lip gloss, and talking for hours on the telephone. Those were good, warm suburban summers that I now recall fondly, but back then, when my primary exposure to new music was a Toronto radio station called Hot 103.5, I never would have guessed that twenty years on I’d be sitting on the other end of a landline with McLachlan talking about her forthcoming induction into the Canadian Music Hall of Fame and the challenges of raising her own two young daughters in a strangely Orwellian world. Naturally, I’ve since recognized the incredible singularity of McLachlan’s voice, and if I’m being honest, often find myself sitting around with a particular old friend of mine, making impassioned attempts at singing the endless list of hits that comprised 1997’s Surfacing. And yet, despite her stature as an artist who has not only sold more than 40 million albums worldwide, but is an Officer of the Order of Canada and the recipient of ten Juno Awards, three Grammys, and countless other accolades, McLachlan, who called from her home in Vancouver after returning from an afternoon walk in the woods with her dogs, was thoughtful, thankful, funny, and every bit as lovely as I had hoped she would be. For the next hour, we spoke candidly about the ups and downs of a career that started almost 30 years prior in Halifax, Nova Scotia, when she was just 17. Discovered by Mark Jowett, who was both a member of electronic group Moev and the co-founder of Vancouver-based independent label Nettwerk Productions (now Nettwerk Music Group), during a gig at Dalhousie University, McLachlan, who at the time was fronting a short-lived pop band called The October Game, was offered a recording contract with Nettwerk. Though her parents, a couple of American expatriate academics, felt strongly that she should finish high school and complete at least one year of post-secondary studies­­––something McLachlan did do at the Nova Scotia College of Art and Design––two years later she accepted the deal with Nettwerk and relocated to Vancouver to explore the possibility of starting a whole new life. Evidently, that proved to be a wise decision on McLachlan’s part. Her relationship with the Nettwerk team, specifically her manager Terry McBride (co-founder / CEO of Nettwerk Music Group), endured for more than two fruitful decades and helped to take her from an insecure and musically inexperienced teenager to the multi-platinum selling internationally celebrated singer-songwriter she is today. All of that began on the back of McLachlan’s debut album, Touch, which was released in the fall of 1989. Though the album itself, which featured fan favourite, “Vox,” was both a critical and commercial success in Canada, it really wasn’t until she met now long-time producer and friend, Pierre Marchand, that she truly began to find her voice and flesh out her distinctly atmospheric alt-pop sound. The result of Marchand’s efforts can be heard loud and clear on the pair’s first collaboration, 1991’s Solace. The album was McLachlan’s sophomore effort and became the foundation upon which the two have built an artistic partnership that not only flourished through the recording of seven additional full-length albums but that continues to endure today. By the time McLachlan had completed a 14-month promotional tour in support of Solace, which spawned two successful singles, “The Path of Thorns (Terms)” and “Into the Fire,” she was a bonafide star at home in Canada and had also developed a strong cult following across the U.S. But, at that particular moment in her career, it wasn’t record sales or recognition that impacted her perspective the most, it was a trip she took to Cambodia and Thailand to work with World Vision on a Canadian-sponsored documentary about poverty and child prostitution in late 1992. In fact, the experience cemented itself so deeply within McLachlan that it began to trickle down into various aspects of her career and daily life. Her time abroad not only informed much of her third album, 1993’s Fumbling Toward Ecstasy, but also opened the door for what would become a lifelong commitment to support various charitable endeavors including animal welfare, disaster relief, HIV/AIDS, and cancer research. “When we started Lilith [Fair] that just came into an even bigger playground,” she adds. Perhaps one of McLachlan’s crowning achievements, the now legendary Lilith Fair—which was the most successful summer package tour of 1997—focused on raising money for various women’s charities and on creating an infrastructure for female artists during a time when so many were being blatantly mistreated by their counterparts in music industry. At the time, top-earning festivals like Lollapalooza and H.O.R.D.E were primarily featuring male-dominated acts. Knowing this and that there was a wealth of great music being made by women who were having real success independently, McLachlan and the Nettwerk team felt it was important to bring those women together not only to have a little fun but also to celebrate them publicly. Between the summers of 1997 and 1999, the Lilith stage was home to everyone from Sheryl Crow, Sinéad O’Connor, Erykah Badu, Lauren Hill, and Paula Cole to Fiona Apple, Martina McBride, Missy Elliot and even a still unknown Christina Aguilera. But, in spite of the festival’s spirit of goodwill, the media backlash against both McLachlan and Lilith began almost instantaneously. “When we started the whole thing up we weren’t necessarily thinking about what we were going to achieve,” says McLachlan. “We just thought, ‘Man this is going to be great!’ But then it developed into such a huge thing; I wasn’t the least bit prepared for the criticism we received. Sensing her frustration, country legend and fellow Lilith performer Emmylou Harris offered McLachlan a bit of much-needed encouragement. In the midst of all the backlash, the then 28-year-old McLachlan was also promoting her fourth studio album, Surfacing. In what proved to be a very astute business move, her label made the decision to release the album to coincide with Lilith’s first run and Surfacing, which featured such iconic hits as “Building a Mystery,” “Angel,” and “Sweet Surrender,” became McLachlan’s international breakthrough. But, by that point, the train was moving, and McLachlan wasn’t about to hop off. Over the course of the next two-and-a half years, she toured heavily, returning to the Lilith stage each summer, and released the multi-platinum selling Mirrorball, which chronicled her life on the road and served as her first live release. And that’s exactly what she did. At the height of her career McLachlan took an almost three-year hiatus from the business and did not return until the release of 2003’s Afterglow. A lot changed for her during that time. She lost her mother to cancer in 2001 and soon after became a mother herself when she gave birth to her first daughter India Ann Sushil Sood in 2002. She also founded the Sarah McLachlan Music Outreach program, a venture that has since grown into the Sarah McLachlan School of Music in Vancouver, and was designed to offer free music education, mentorship, and support to underserved and at-risk children and youth. “I learned a lot about mentorship through doing Lilith and I had made all of this money that I had no idea what to do with it. I knew I needed to continue the work we were doing but I didn’t know how to do it quite yet. Not knowing how to create a music program herself, McLachlan turned to Carol Henriquez, the founder and executive director of Arts Umbrella, for guidance. McLachlan and Henriquez began by creating a pilot project that included 219 kids. They developed the curriculum and brought in an incredible group of teachers whose primary focus was helping their students to discover that they had voice. “You can probably count on one hand, if you’re lucky, the teachers you remember through school,” says McLachlan. “I mean an adult that actually recognized you, spoke to you on an equal level, and really taught you something. If you remember them, that’s because they were important and they helped develop who you are today. I have three so I’m really lucky––three that actually gave me that sort of personal connection and helped me see that I had something of value to give and say.